Founded in 1929, Organic Humboldt Creamery has been owned by Crystal Creamery and the Foster family since 2009. It has been sourcing local dairy milk and producing dairy products for more than 80 years. In 2003 the creamery first introduced its organic dairy products with the certification of its facility at Fernbridge, and that considerable investment underscores the company’s long-standing commitment to the highest quality premium dairy products. To support the expansion into a nationally distributed organic brand, Humboldt Creamery decided to undergo a complete relaunch of the brand to refresh its look and strengthen it’s position as a producer of high-quality organic dairy products and its long heritage in the dairy business. Criterium was the lead agency in all of the marketing communications and interactive activities of the brand re-launch, including strategy, research, planning, public relations, sales support, retail promotion, print and web advertising, and the dynamic new web site at humboldtcreamery.com. Criterium was also the producer of a new brand video that highlighted the unique attributes of the region that give their dairy products such high quality and great taste. In addition, Criterium developed a new brand ambassador program that culminated in the brand's successful launch at the annual Oyster Festival in Northern California. 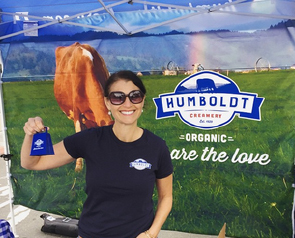 The new marketing programs helped Humboldt Creamery successfully sell in their products into Walmart, Sam's Club, Costco and Whole Foods and the digital, print and promotional support materials continue to support sales throughout the U.S.